Quote: "Y'know, maybe some people don't wanna be found." Profile: Keith Walker was just another underground thug kidnapped and used as an experiment for one of Organization's secret projects. He was designated as "Farseer #1F4". His awakening resulted in him breaking out of the lab, marking him was a experiment to be purged. Keith is never the type to remain in one place; in one moment he is there, the next moment he is gone. While generally sullen and serious demeanor, he has a warm side. 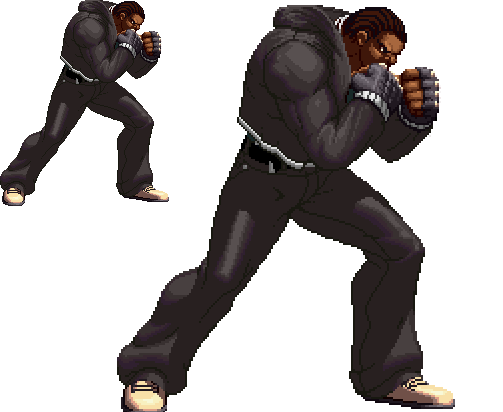 Keith is an accomplished street boxer from the underground tournament days, often patient in his fights. All what he wants to do is to keep his newly developed powers at bay and try to regain the memories that he lost while avoiding possible death from an organization seeking to capture/kill him or melting down by the same powers that he never asked for. 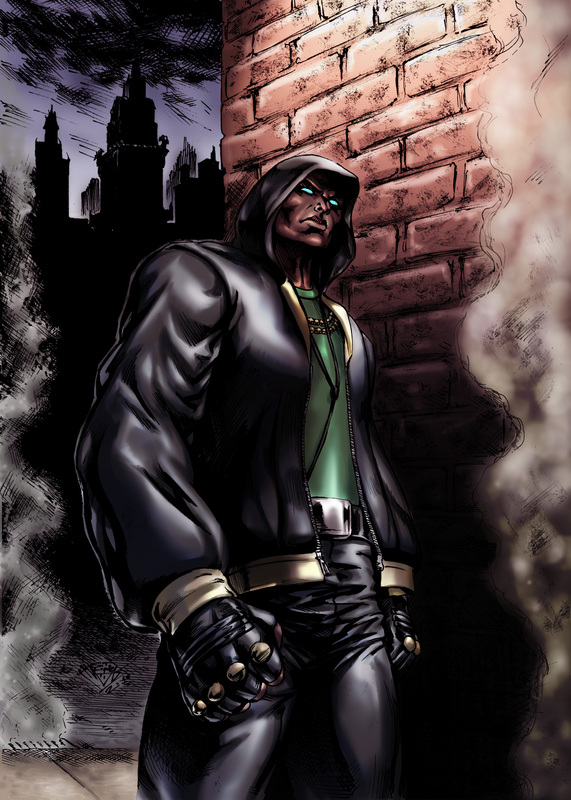 DOSSIER: This subject was a simple underground fighting thug selected for creating genetically enhanced warriors that unquestioningly obeyed their creators. The unwilling subject was the 500th experiment of this project, but the first to survive; we designated him as "Farseer #1F4". Recently, he escaped the divisional laboratory dedicated to the project. Not only is the subject an accomplished street boxer, but due to the experiments, he manifested Psychokinetic Powers; he has limited use of telekinesis, empathy, and telepathy. Incapable of actively using it, he is administered PPAI, but risks headaches from active use, and worse yet, melting down if not provided the serum to negate the effects. Despite the drawbacks, we have faith that the subject will be a path to success. His actions will continued to be monitored, so capture will not be necessary as of yet. We give this subject a risk rating of C.
As far as the man could remember, there was the laboratory. Eyes opened, waking up to an unfamiliar surroundings. The still calmness of the air and the pure white walls with machinery that stretched from the entire room. What's worse, he was behind some glass and strapped to some chair. By his own will, he managed to burst the arm-clamps and the chains apart. A researcher approached him, begging him to go back to the isolation chamber. "Farseer #1F4", he was called. "…Who are you? Where am ? … Who am I?" As the amnesiac asked those questions, a strange energy manifested around him and it slowly overtook the researcher's life. Stunned, the amnesiac man wandered out, until a group of men in body armor greeted him at the entrance with tasers. It only served to enrage him and react violently, encasing the units within that strange energy that overtook the researcher's life. The alarm was raised and more men in bodysuits came out trying to detain him. Farseer #1F4 took to the men in hand-to-hand combat, feeling the familiarity of his street boxing style. He was uncertain why it felt second nature to him, but he continued the fight. And then he felt it, the burning feeling that grew stronger. That formerly discomforting power that he unleashed became a lingering suffering. The guards crew fearful, shouting that he was "going live". Farseer #1F4 wiped out the entire squadron with his strange power in an explosion, only to find himself suffering from the power. All what he could ask was, "What the hell is this power?". Farseer #1F4 made it into the main hall, only to be greeted by the head of the research division. The Head noted that Farseer #1F4 performed admirably despite just awakening and that the Psychokinetic Power seems to be adequate. However, the experiment was not in the mood to talk. He knew that asking questions would get him nowhere, so he beckoned the man into a fight. The head researcher was not a man to be triffled with. He was quick and powerful, easily smacking the project around. As the man tried to hold his own, he found it difficult with the man cutting through his defenses. That power grew stronger, putting the man in the state of "going live" once more. It was the Psychokinetic Power that saved him, but nearly killed him. He looked through his belongings in his pocket, only finding a coin and an identity card. "Keith Walker" was his name. Keith would hold onto that name and that identity card. He had a life before this. He would try to find that identity again. Rush: This is essentially Keith's personal flavor of brawling. When he times it right, he'll rush in to assault/take down his target. It's a preferred method of taking out a target. Just Defend: Given that Keith is a very patient person, he has learned to mitigate injuries from his fights. He is skilled enough to move with the blow and back into the position so that he can take advantage of it. Restore: Keith has the stamina to keep moving with the fight. Given his patience, he paces himself to keep his fighting spirit up so that he doesn't fall easily. Patient: Keith is not a person who likes to rush into battle. While he does operate in a rush style, he likes to assess who he is dealing with by beginning with easy strikes. It helps him consider his opponent before figuring out when to apply rush tactics. 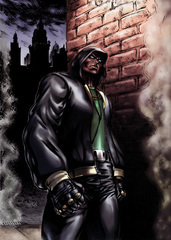 Steadfast: Keith doesn't care for flashy defenses He is pretty conservative in a fight when it comes to tactics. He prefer to keep things simple. The point of the project was to create genetically enhanced warriors that would obey their creator. The experimentations on Keith modified his DNA with the capability of withstanding extreme conditions whether heat or the cold. Through the organization's genetic experimentation, Keith is infused with raw psychokinetic powers. He is unable to use them actively without the use of Psychic Power Activation Injector, a gun-syringe that inserts chemicals into the body. However, the active of the Psychokinetic Power will cause headaches. Further use of his powers will push Keith to the point of experience a melt down, which can cause grave harm to those around him and may kill him if kept unchecked. Psychokinesis: This is nothing more than a brute force variant. Telepathy: Keith is actually limited to receiving thoughts directed towards him. He is not proficient enough to send thoughts to another person. Empathy: Keith is capable of sensing emotions in others within the vicinity. The intensity is greater when he makes contact with the person's skin. Keith has the ability to set his location from one point to the next. However, this is only within a 10ft that he can do so. Keith takes the hybrid approach as a Boxer-Puncher; using rush-tactics while exercising patience before initiation. Keith has the technical skills of an out-boxer, being quick on his feet and reliance on weaker jabs at first, while using his immense strength for brutal punches and pressure when the timing is right. It has been something honed from his time in the streets, using many fighters' aggression against them through opportunity. Within the public eye, Keith is there one moment, but in the next moment as people or a vehicle pass through, he is gone. Despite his size, he is proficient at blending in with the crowd and getting away from prying eyes when needed. Keith generally relies on his strong physical attacks. The use of Inject: Soul Charge allows him to his his Psychokinetic Powers. Keith will flip a coin into the air. As soon as he catches it, however, it can be a various set of attacks that he'll do. Keith will briefly adopt a stance that allows him the moment to weave around and strike his target with quick jabs and break through their defenses. In this moment, he has a better chance of evading his next attack. Keith will launch at the target to spear them into the ground. Should he get them tackled, he'll straddle on them and punch them in the face repeatedly. Keith will step in, lunging forward with an uppercut towards the target. The strength of the uppercut is intended to crush the defenses of the opponent. Keith will toss his coin at the enemy. 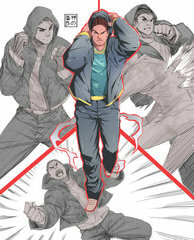 If successful with the strike, Keith will lead in with multitude of strikes, then weaves his body around in a figure eight with series of punches. Keith pulls out a gun-like injector, the Psychic Power Activation Injector (PPAI), and places it to his neck. This triggers a [Soul Gauge] which will allow him to use his Psychokinetic Powers. This is the state of Keith 'going live', which is short for livewire. As soon as it activates, Keith's body releases an explosion of voltage. The explosion will radiate around Keith, tearing at everything in its path. Galerians: For those that are unfamiliar, it's the story of an amnesiac boy who wakes up in a lab. He breaks out, following a voice calling for him and it goes from there. The influences that I picked up was the use of psychic energy and the consequences of it. In particular, the Galerians tend to short circuit, in which that their powers go haywire and may have the potential to kill them. Urban Reign: PS2 game that is the spiritual successor of Final Fight, except done by Namco. 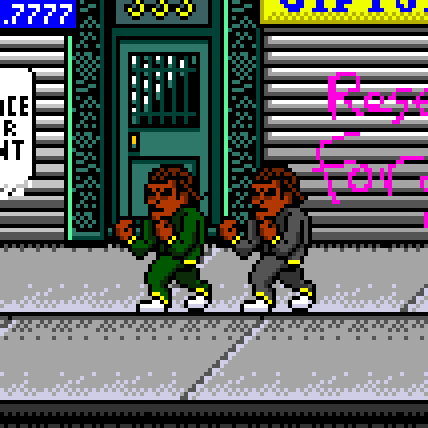 It's a beat 'em up that takes place in the streets where you fight through various gangs. It incorporates various street fighting and wrestling maneuvers. Check it out. 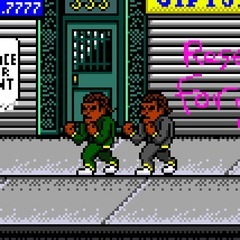 The street-life fights are what influenced the design. 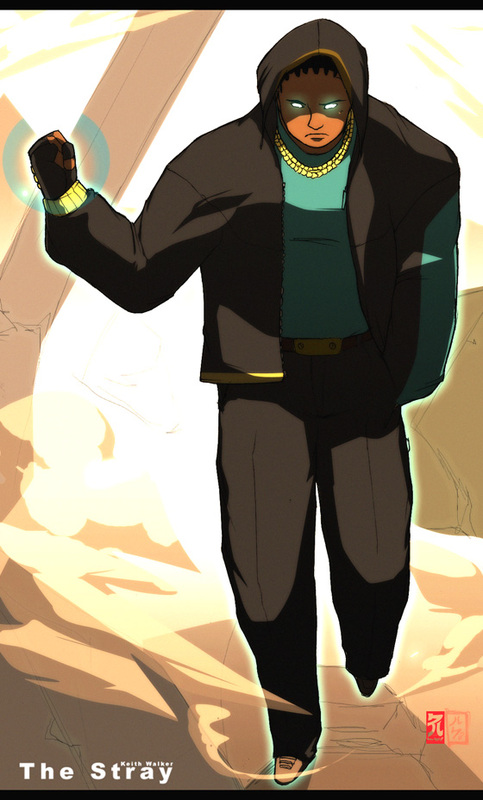 Specifically, the character that I based him off of was Grimm. Keith EX, or Farseer #1F4 is within the unbounded stages. He can channel his psychokinetic power with ease. However, the risk of death within this mode is imminent, as he is overloading himself. Keith will lunge forward with a series of hard hitting blows to overwhelm the opponent. Keith gives a punting kick, releasing a shockwave of telekinetic energy that tears through the earth. Keith will step in, lunging forward with an uppercut towards the target. The strength of the uppercut is intended to crush the defenses of the opponent, followed by the cyan flames that erupt. This is a quick burst of Psychokinetic Powered energy that fires off. Visually, it appears as a small burst. Can only be done on close-range. Can also reflect projectiles. Keith snaps his fingers, flames ignite near the enemy. The target's body will light in what appears to be cyan flames. 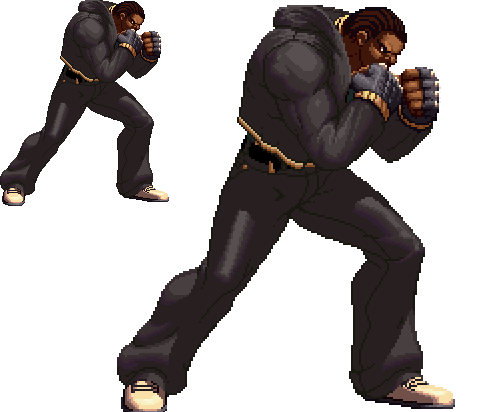 Keith will grab the opponent, slam them into the ground, and expel a gargantuan force of his Psychokinetic Power. Keith lunges in delivering punch after punch, similar in the vein of the famed 'Dempsey Roll'. The final wind up punch results in an explosive burst of cyan-colored psychokinetic energy. Keith will telekinetically grab the target and start bouncing them all over the place. Where his arm swings is where they will be flung.